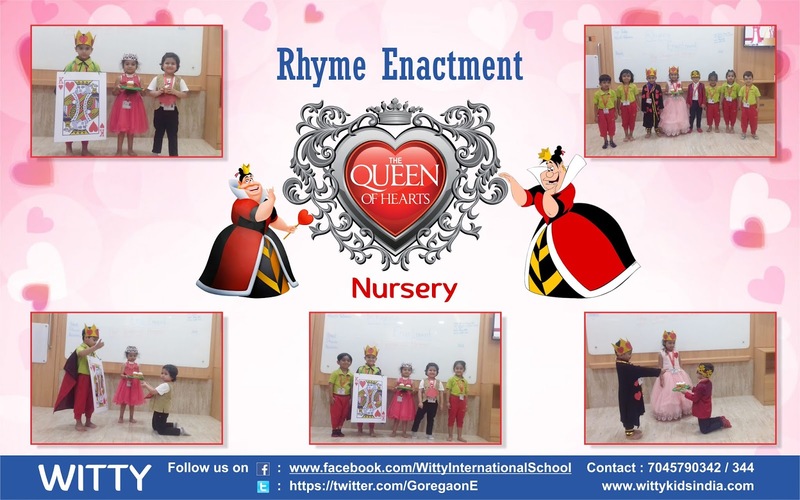 Poetry comes alive to oneself by recitation. 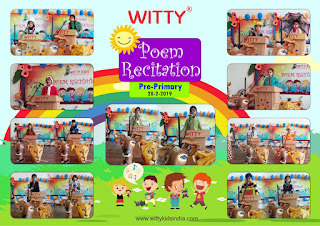 Poetry is the art of expressing oneself and allowing the feelings to flood out. Reciting a poem is tough not easy, rather meticulous, is a journey all itself that presents struggles as well as surprises. 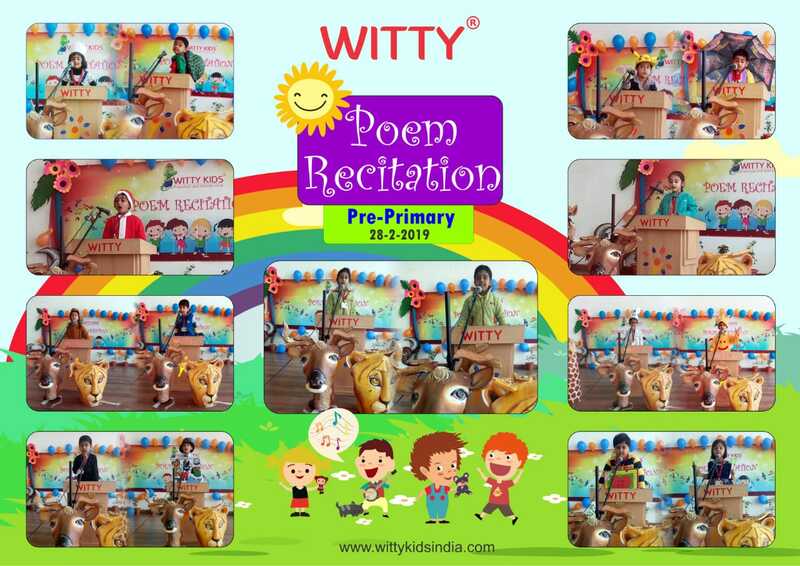 On Thursday, 28 February 2019 little Wittians of WIS, Udaipur got an opportunity to exhibit their talent and confidence through poem recitation. 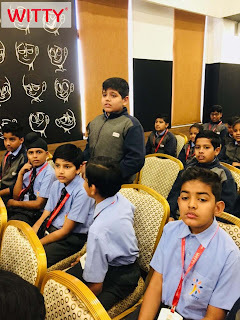 It was overwhelming to see them coming on stage with confidence and confronting the audience. They created magic all around by reciting their favourite rhyme along with the different props to maintain originality of the poems, which made the recitation more attractive. 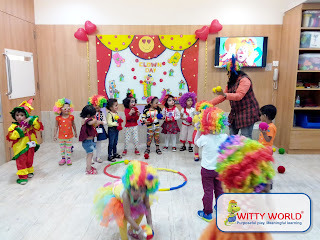 Air was filled with cheering and tons of encouragement for the young ones. A good learning experience was exhibited and enjoyed by the little ones of Pre Primary. 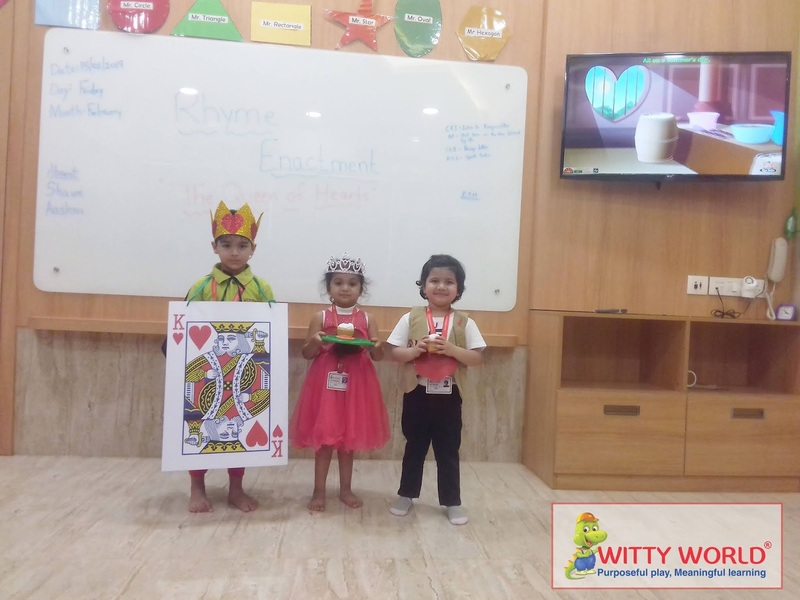 It was an activity they would cherish for long time. 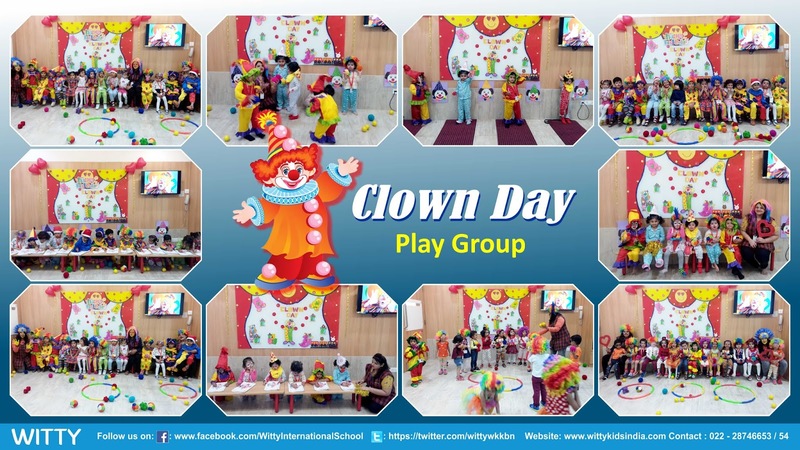 Witty International School, empowers the students to evolve as confident individuals. Choral Recitation is one such platform which professes confidence, team work & synchronization. 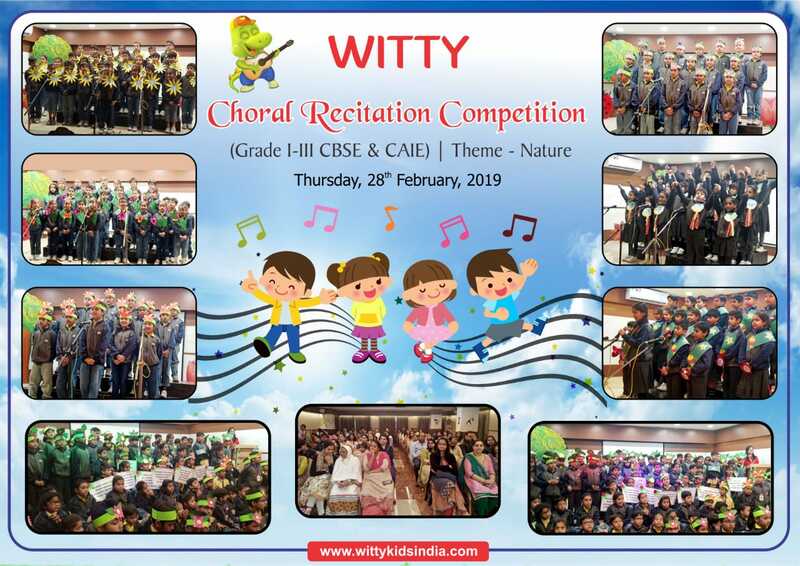 On 28th February, 2019, Choral Recitation Competition was organized at the newly launched preschool at Emerald, Witty World auditorium . Students exhibited poise, voice modulation, and enamored the audience with their skill of expression, rhyme, rhythm and collaboration. 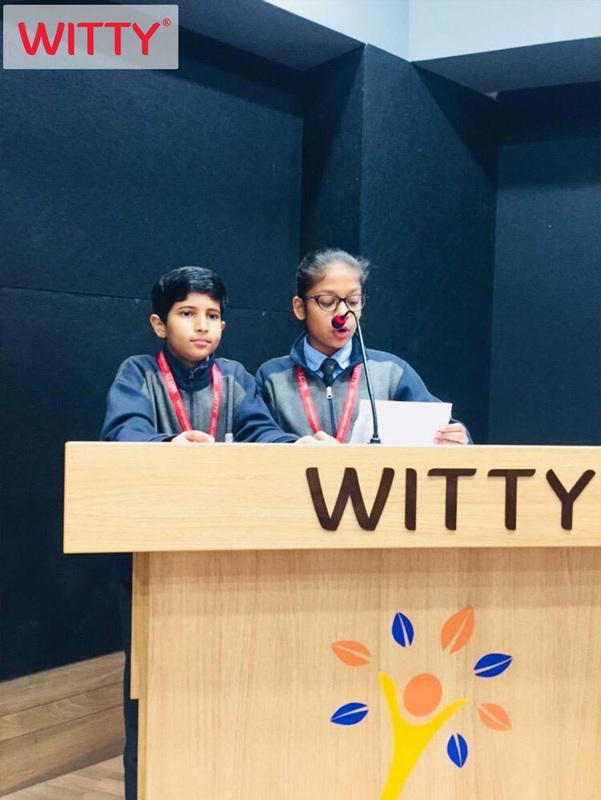 Parents were spell bound to see their children performing with enthusiasm and excitement reverberating the auditorium with their recital. It was a mesmerizing event, greatly appreciated by the parents our efforts of reviving the practice of Poetry recitation. 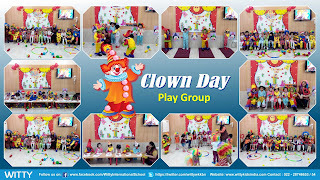 He is rolling over like a ball. 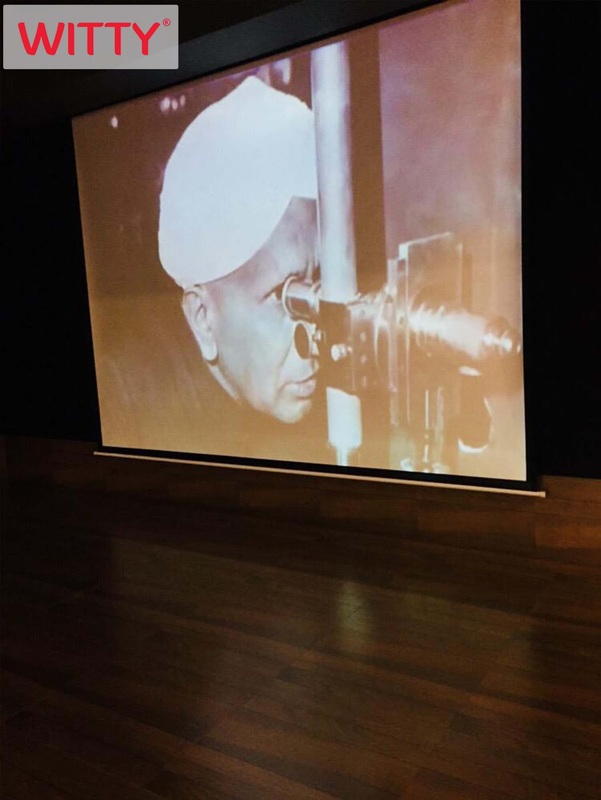 He does not seem to care at all. 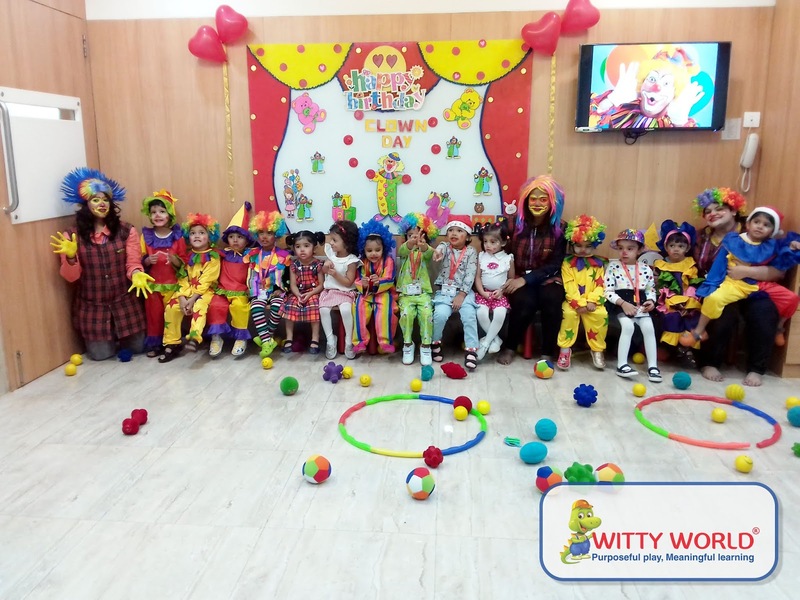 A circus theme brings out the performer in everyone. 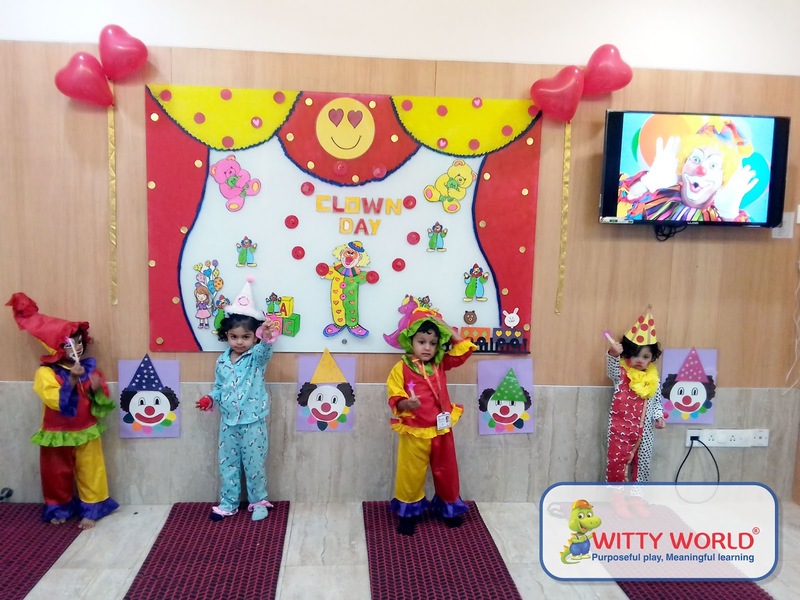 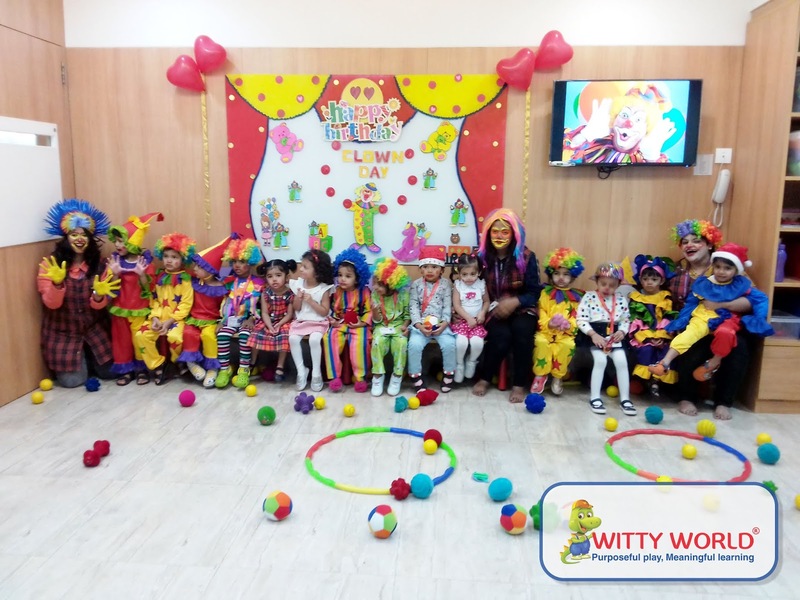 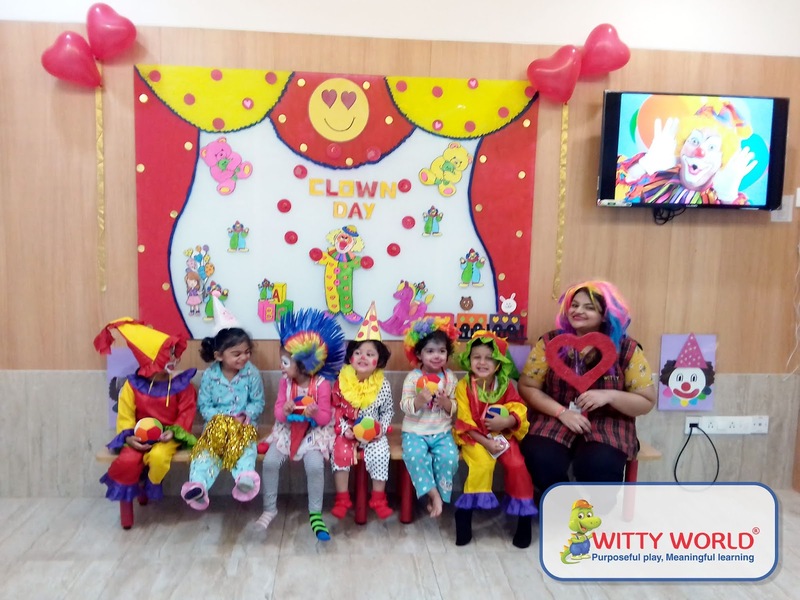 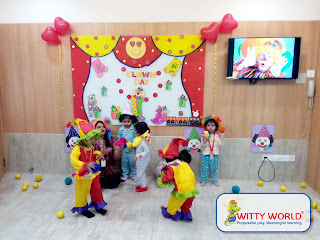 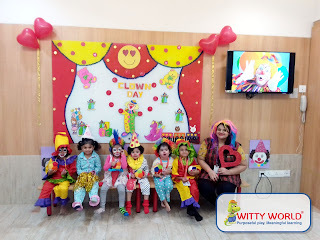 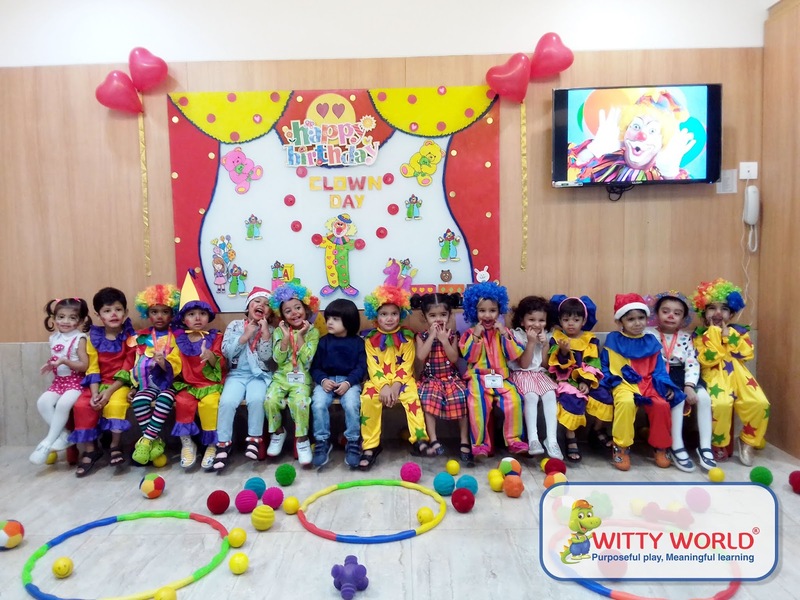 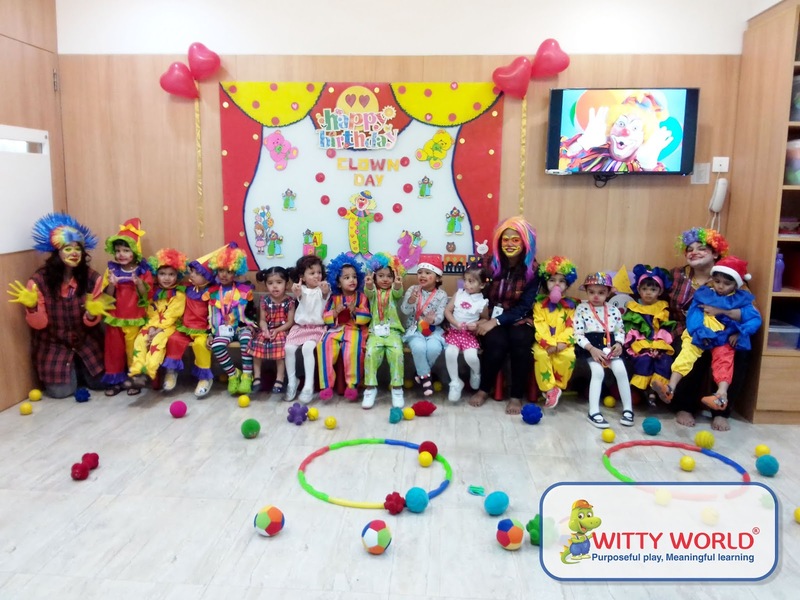 On Wednesday, 27 February, 2019 little Wittians of Playgroup class celebrated “Clown Day”, as they were introduced to the concept of Clowns. 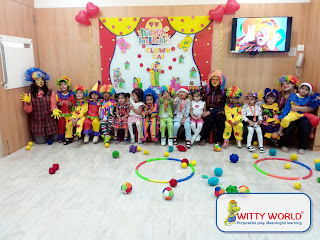 Children came dressed as clowns with funny faces, colourful wigs, mis-matched clothes, and painted noses!!! They enjoyed playing with hoopla rings and had fun playing the game- “Pin the Clowns Nose.” Coloring on a clown worksheet was also a fun activity. 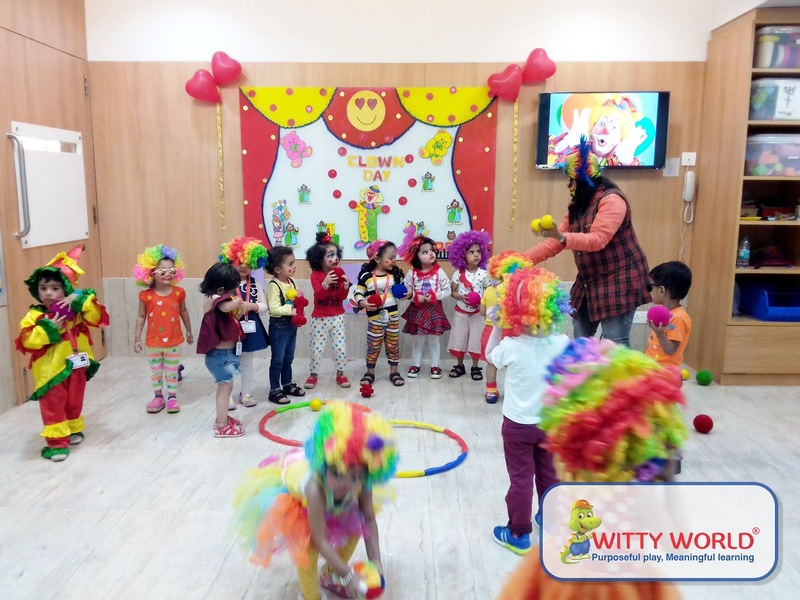 The entire atmosphere in the class was vibrant & cheerful. 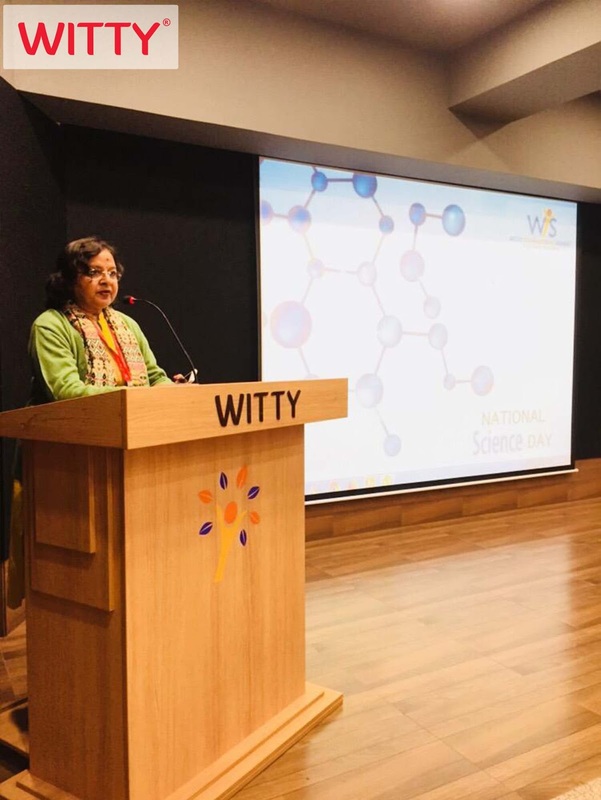 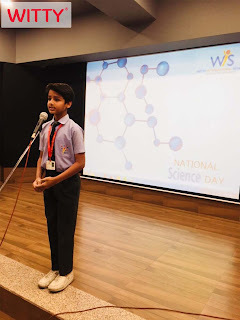 Witty International School, Atun Road, Bhilwara celebrated the National Science Day on February 28, 2019 in order to commemorate the invention of the Raman Effect (effect on scattering of light when passing through different materials). Sir C.V.Raman’s great success and discovery has been marked in the Indian history through this day. 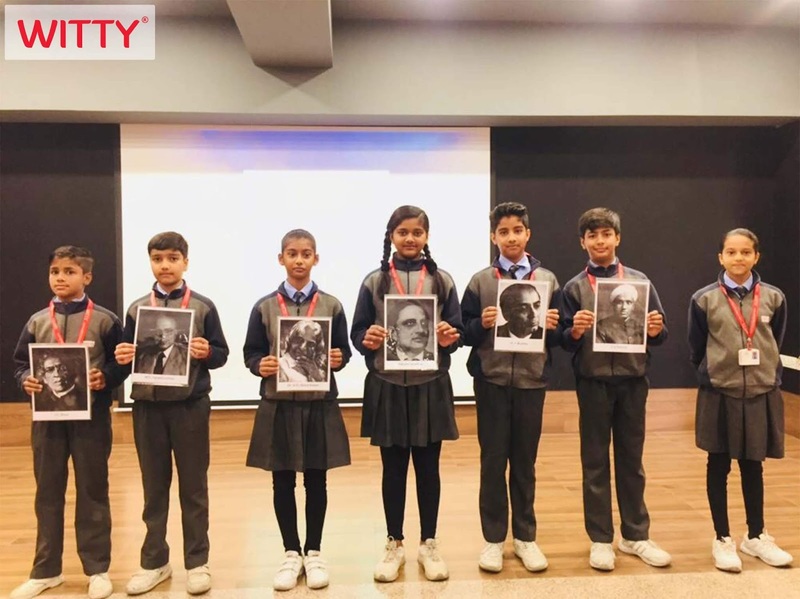 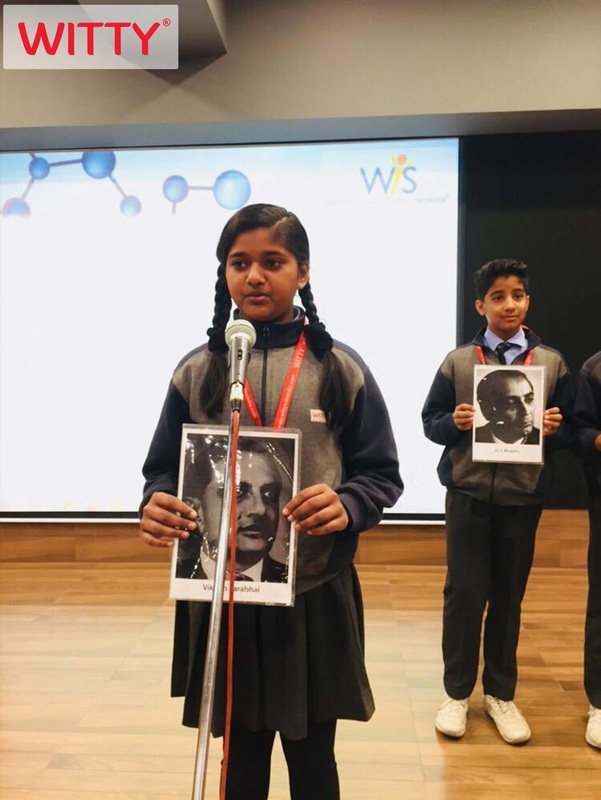 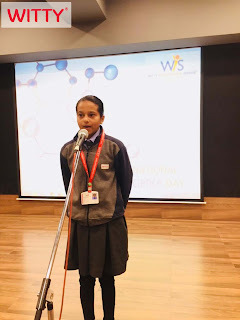 Students learnt about the theme of the science day that is, “Science for the people and people for the science” through a speech and role play presented by the students of Grade 5 and 6. 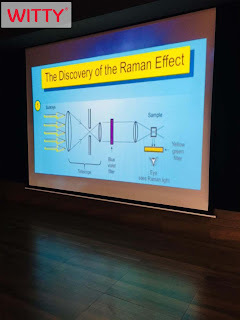 A video based on Sir C V Raman’s life was shown to the students. 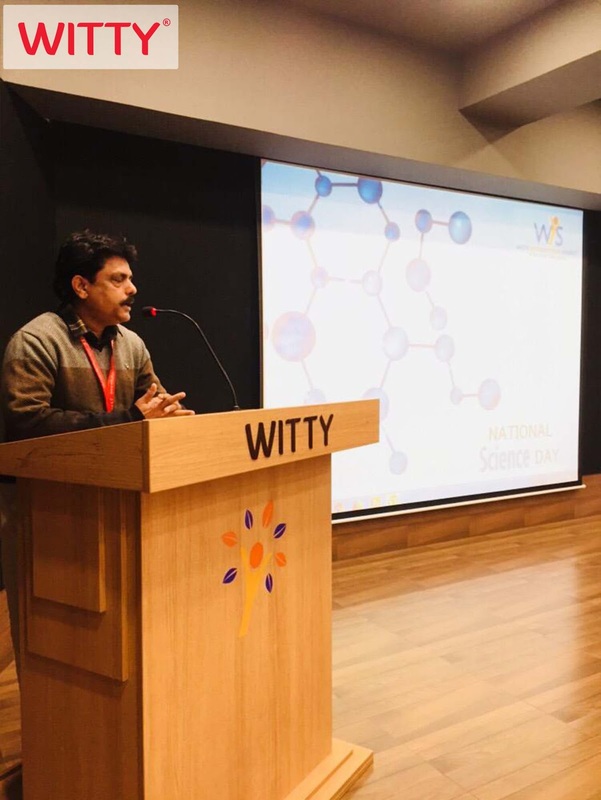 The Vice Principal, Mr Aarif Khan motivated the students and told them that they need to develop scientific temper so that they could be better scientists, better citizens and capable of governing their personal thoughts and actions in a scientific manner. 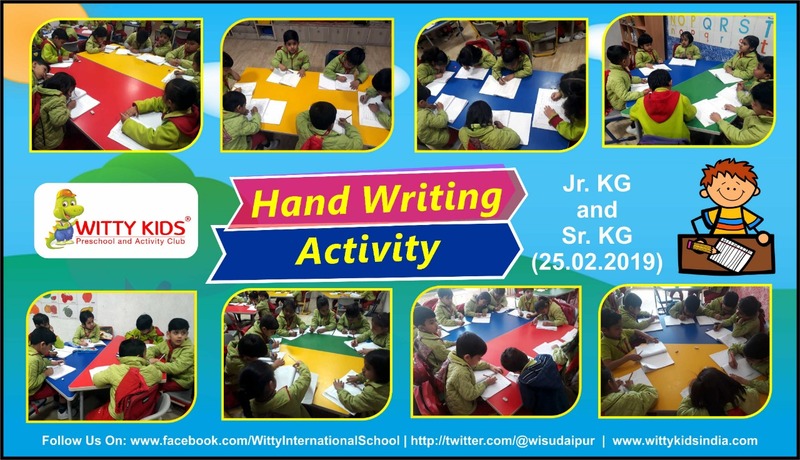 Handwriting is important part of literacy & essential part of life. It is complex skill that develops over time. Handwriting starts with scribbling and drawing then moves on to forming letters and words. 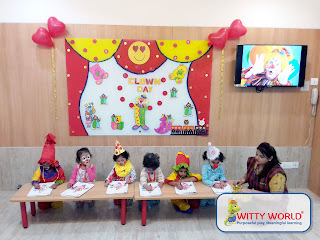 To learn handwriting children learn to combine fine motor skills, language, memory and concentration. They also need to practice and follow instructions. 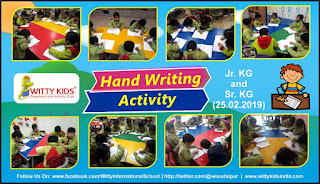 On Monday, February 25, 2019 a handwriting activity was organized in which little Wittians of Jr. KG. 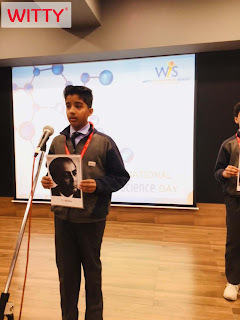 and Sr. KG. 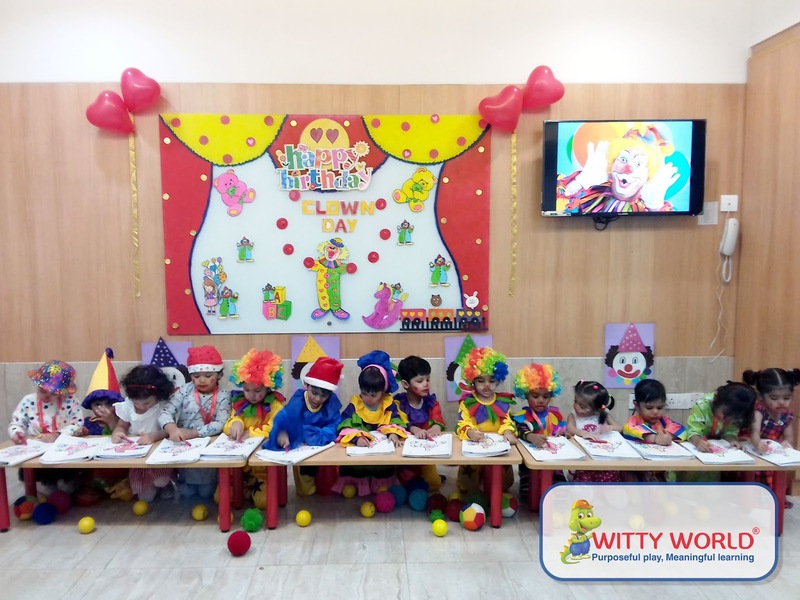 participated with great zeal and enthusiasm to enhance their art of writing. They enjoyed writing a few lines on “Myself”. 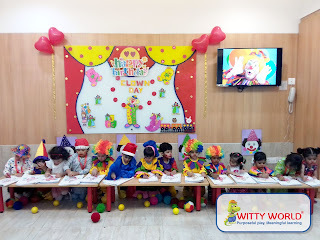 Little ones were taught about the formation of letters, spacing of letters, no omission of letters, spellings and overall presentation. This was a great learning experience for children in which they exhibited their art of writing along with lot of learnings. 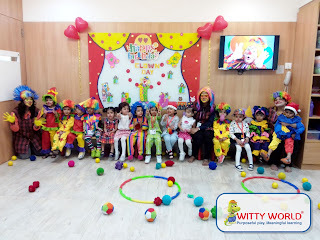 To encourage our little ones a participation certificate was given to them as a reward. 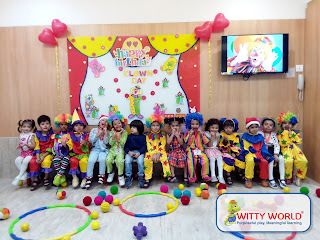 On Tuesday, 26th February,2019 little Wittians of Jr. KG at Witty International School, Udaipur enjoyed the activity, ‘Show and tell’, where toddlers learnt about various birds and their nests. 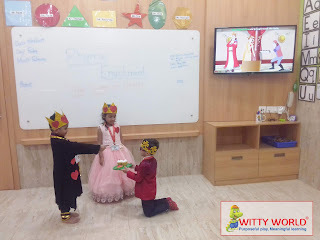 Children brought nest prepared by them. 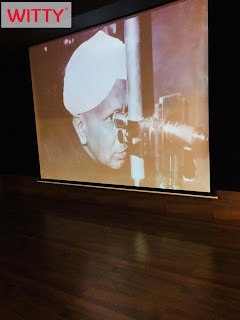 They tried to speak few lines about the Birds and their nests. They got exposure to express themselves. 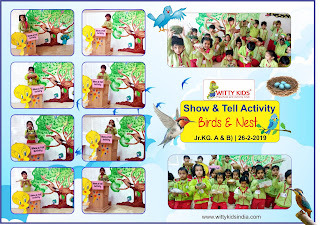 They shared information about different birds and their nests. 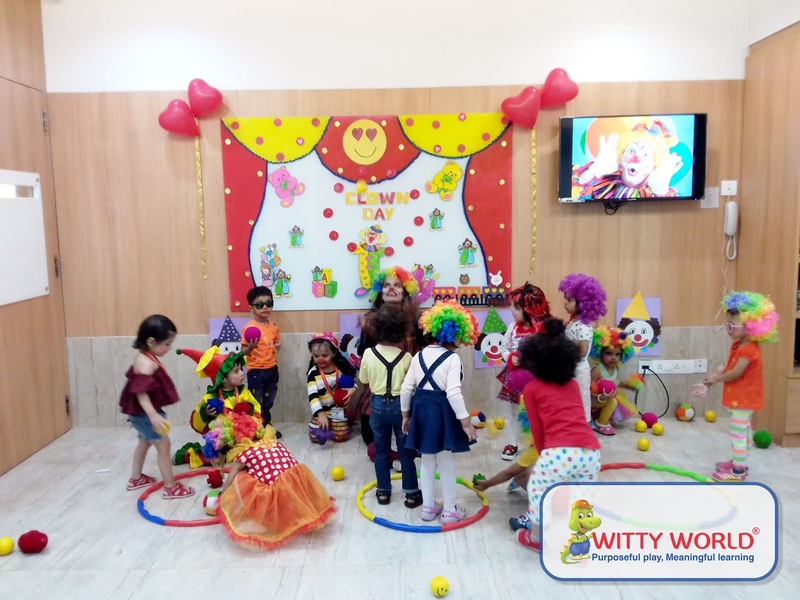 It also gave a child chance to be a centre of attraction for a while as they explained the significance of the nest they brought. 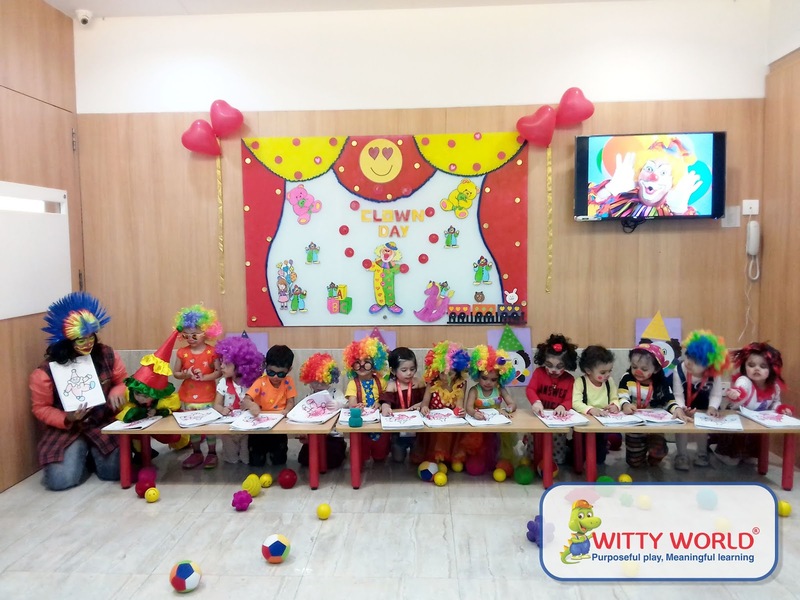 It was an interactive session between teacher and children which enhanced their listening and memory skills. 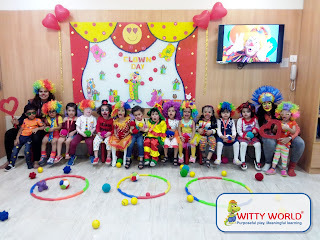 Children happily enjoyed answering questions asked by the teacher. 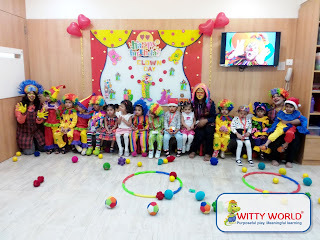 It was a cheerful experience along with the knowledge building. 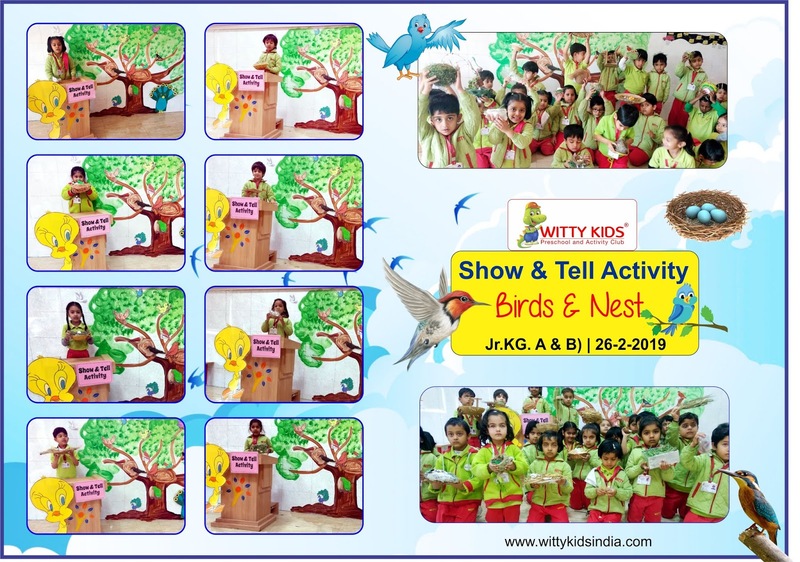 This presentation and discussion about birds and their nests gave them confidence. 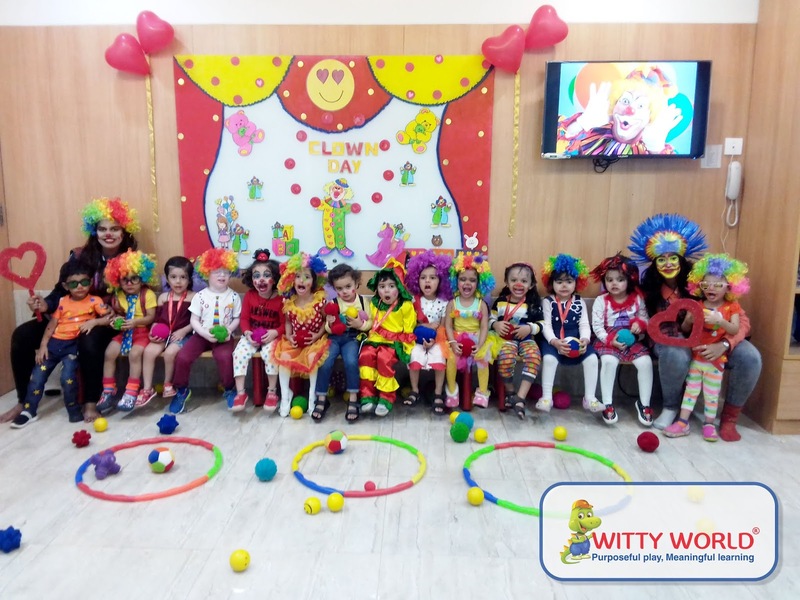 It was a day full of learning and smiles. Little Wittians of Witty World (Goregaon East) enthusiastically came dressed as a Queen, King and Knave. 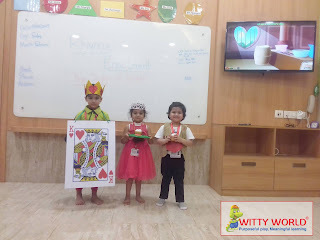 They enacted the rhyme “Queen of Hearts”. 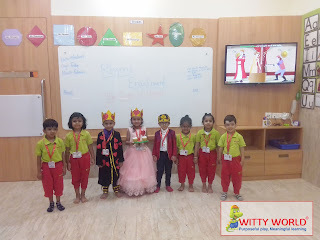 The little ones beautifully represented themselves in the character they were dressed in, for the enactment. They also enjoyed reciting the rhymes with their peers. 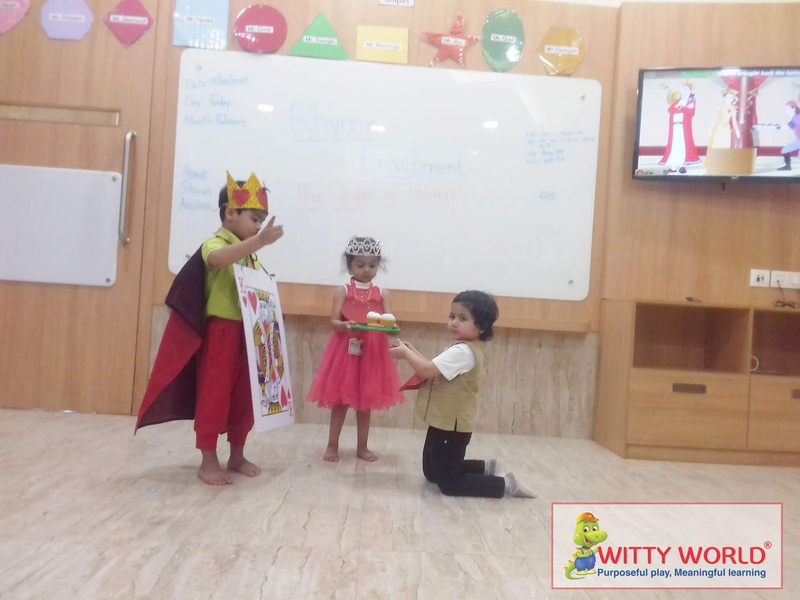 Children were motivated to take part in the enactment to overcome their stage fear. 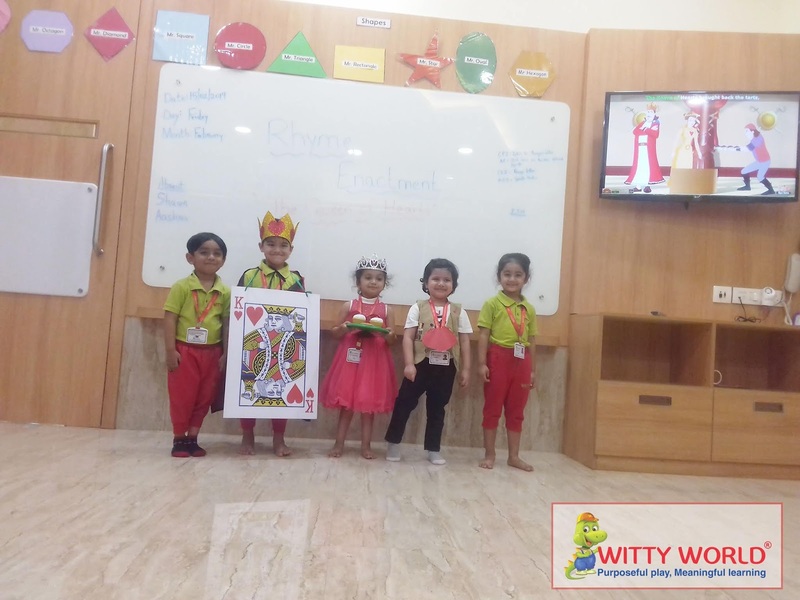 In this way, it was a fun-filled day for the Kings, Queens & Knaves.